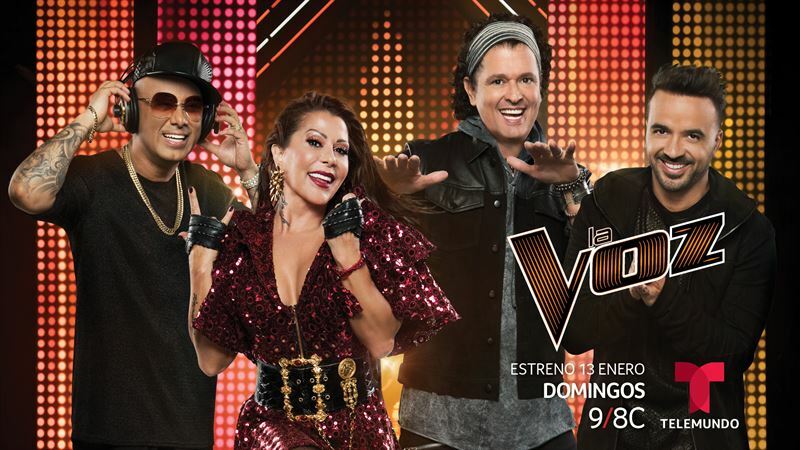 MIAMI -- December 11, 2018 – One of the most influential television franchises and music brands in the world, The Voice will now premiere as LA VOZ, the first-ever Spanish-language version of the hit series set in the United States. Premiering Sunday, January 13 at 9pm/8c on Telemundo and its digital platforms, LA VOZ is hosted by renowned TV personality Jorge Bernal. The highly anticipated musical competition series also features award-winning Latinx music megastars Luis Fonsi, Alejandra Guzmán, Wisin, and Carlos Vives as the Coaches searching and nurturing the most promising Spanish-speaking vocalists in the nation. Since its 2011 premiere on NBC, “The Voice” remains an Emmy Award-winning ratings powerhouse, one that’s discovered some of the nation’s best vocal talents. The first-ever Spanish-language edition for U.S. audiences marks the arrival of the purest vocal talent competition ever seen. It is now time for the Latinx community to present its strongest dynamic musical voices. Before these rising artists can reach the heights of stardom, they will first need to impress four of the biggest legends in the Latin music industry. Maintaining the same format as the English-language edition, LA VOZ is full of fun, family-oriented and positive first-class entertainment. Emmy Award-winning host Jorge Bernal is one of the most respected Hispanic media figures. Bernal’s history with LA VOZ includes four seasons of “La Voz Kids” in Telemundo. Currently the host of Telemundo’s daytime entertainment show “Suelta La Sopa,” he first joined the network as the entertainment news anchor for the long-running news series “Al Rojo Vivo with Maria Celeste.” A respected journalist and presenter, Bernal has hosted red carpet shows, including the "Billboard Latin Music Awards," "Latin America Music Awards," and "Premios Tu Mundo," and has appeared on NBC's “Today Show.” Throughout his career, he has interviewed some of the most prominent figures in the music industry, including Mariah Carey, Marc Anthony, Ricky Martin, Pitbull, Shakira, and Enrique Iglesias. His social media presence counts more than two million followers on YouTube, Instagram, Facebook, and Twitter. The Cuban-born Bernal, who has also been named one of People en Español Magazine’s “Most Beautiful People,” is married to influential stylist and fashionista Karla Birbragher. Jessica Cediel also joins the team as the Digital Host, a true insider bringing the latest scoop on the coaches and contestants from a unique backstage, all-access perspective. LA VOZ is a production of Telemundo, Talpa Media USA, Inc. and Warner Horizon Unscripted & Alternative Television. The series is created by John de Mol, who serves as an executive producer along with Cisco Suarez (Telemundo), Stijn Bakkers (Talpa), Tim van Rongen (Talpa), and Macarena Moreno (Telemundo). For more information about LA VOZ, viewers can follow Facebook, Twitter and Instagram @LaVozUS using #LaVozUS, and visit Telemundo.com and YouTube. For more information about Telemundo, please visit nbcumv.com and connect through Facebook, Instagram, Twitter @Telemundo, using #Telemundo and visit telemundo.com, and YouTube.